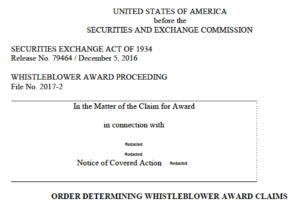 On December 5, 2016, the Commission issued an Order determining several SEC whistleblower award claims in a particular action. The Order granted one claimant’s award application, resulting in an SEC whistleblower reward of $3.5 million. It also denied SEC whistleblower awards to two other claimants. In denying an award to one of those claimants, the Commission discussed the SEC whistleblower rules disqualification for information derived from public news articles. The Order only gave a general statement approving the $3.5 million award, without going into much detail. As for the other two claimants, the SEC’s Claims Review Staff (“CRS”) had issued a Preliminary Determination denying SEC whistleblower rewards to them. The CRS’s Preliminary Determination recommended that the second claimant be denied an award for two reasons. First, the claimant did not provide the SEC with any information that led to the successful enforcement of an SEC action. For additional information about the “lead to” requirement, click here. Second, the claimant did not submit an application for an award until after the application deadline had expired. For additional information about the award application deadline, click here. Only one of the claimants appealed the Preliminary Determination to the Commission. The Commission’s Order upheld the CRS’s denial of an award to that claimant, as well as to the other claimant who did not appeal. As part of the appeal, the claimant argued that certain information provided to the SEC “should” have led the SEC to open an investigation. Much of the discussion in the Order is devoted to rejecting the claimant’s “should have” argument. The determinative fact was that the information simply “did not” cause an investigation to be opened, reopened, or cause the SEC staff to inquire into new or different conduct. Other significant attention was paid to the untimeliness of the claimant’s award application. The Order re-emphasized that missing the application deadline is an absolute bar to receiving an SEC whistleblower award, absent extraordinary circumstances. In a footnote, the Commission discussed what the claimant’s information consisted of, and why it would be subject to an SEC whistleblower rules disqualification regardless of the claimant’s other arguments. According to the Order, the claimant submitted an article that was printed in a magazine. That article was based on a NASDAQ press release. There is nothing in the Order that would indicate that the claimant was an original source of the information contained in either the press release or in the magazine article.